​Cast loam is a patent pending alternative to Poured loam in which gypsum is added to speed the drying process. Because we wanted to have an insulated floor construction we decided to install beams on top of the foundation slab and pour cork grains in between. The beams were covered with OSB boards. 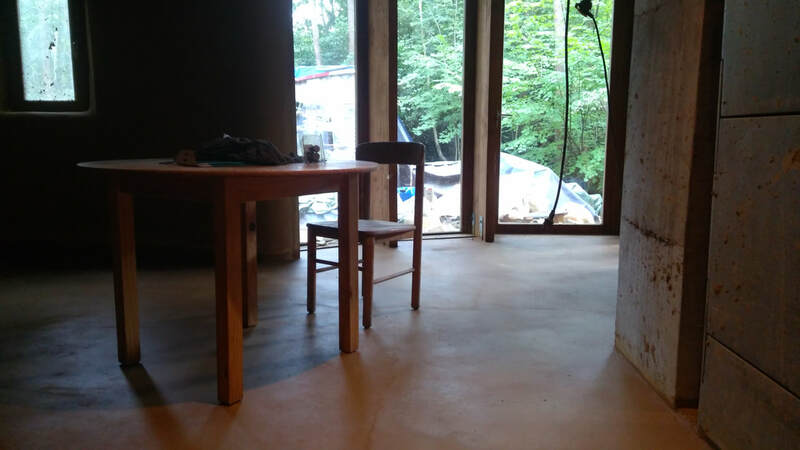 ​As a result we were left with only 5cm of space for a floor finishing layer. 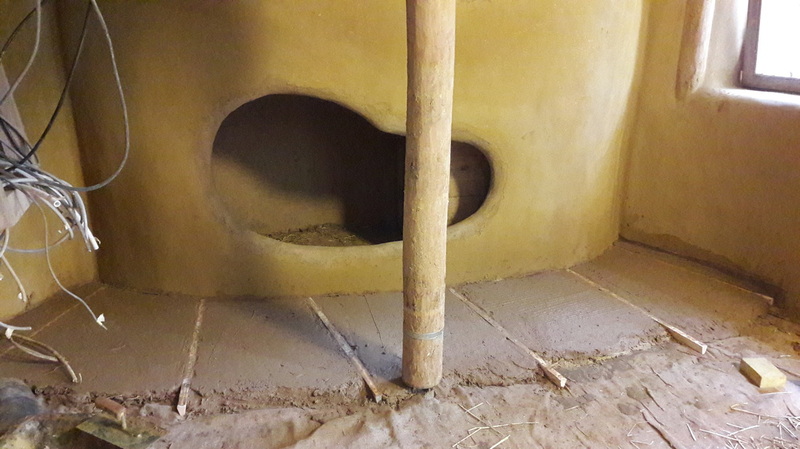 ​This eliminates a rammed earth option and leaves us with a Poured loam finish or a cast earth finish. Both methods are very similar. 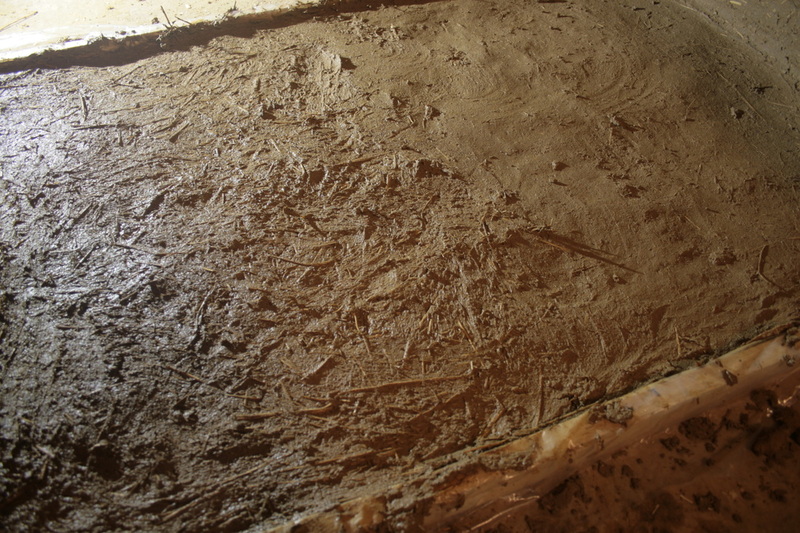 Actually Cast earth is a patented method with a mixture of poured loam and gypsum. The later has the advantage that it dries rapidly. As speed is not of our concern and I prefer to use only loam (less impact on nature), we'll go for the poured loam option! 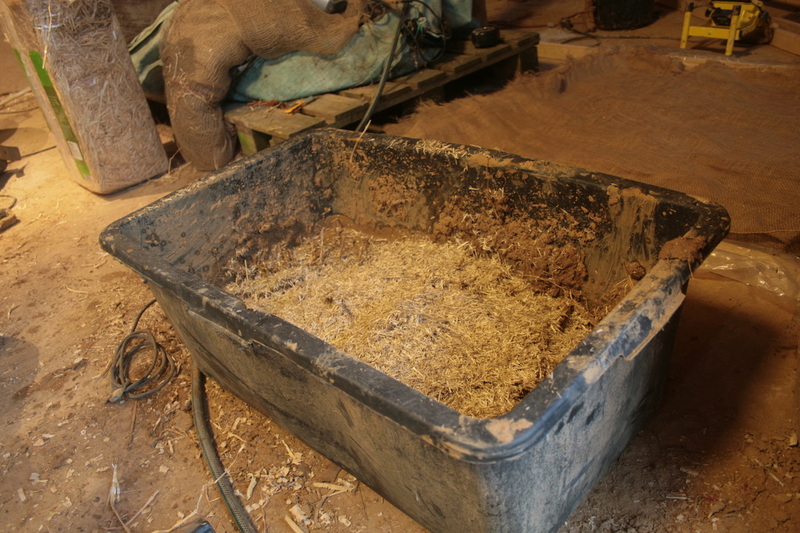 Putting a thin (5cm) loam floor on top of wooden boards (OSB) is not without risk! 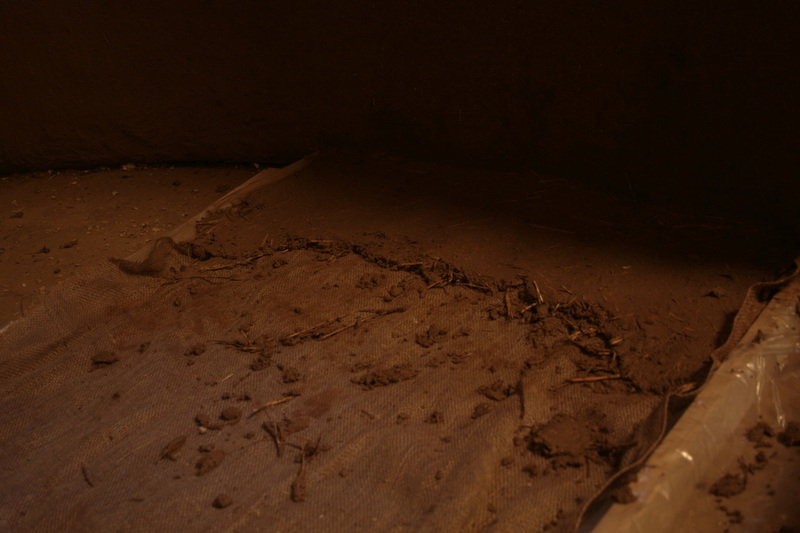 My fear was that the movement (by walking, jumping, etc) of the wooden floor would make the loam floor on top crack. 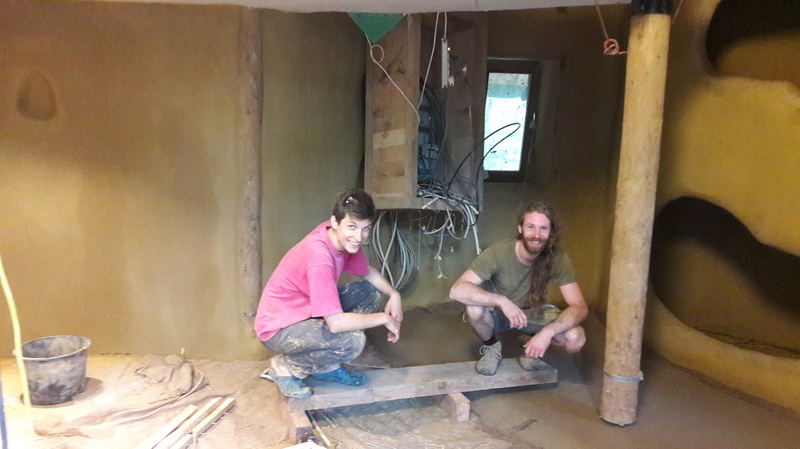 Before we started on the loam floor in the house we decided to make a try-out on a small area. 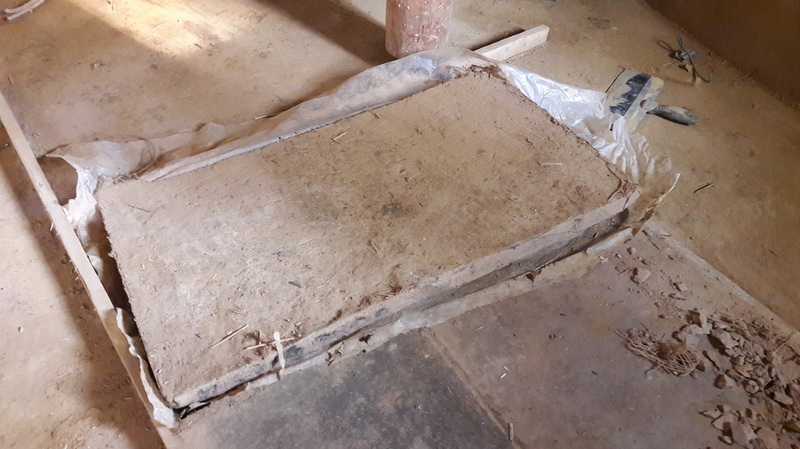 I covered the boards with a plastic foil to prevent moisture from seeping into the insulation and to keep the movement of the boards independent of the loam layer. Next I added a burlap layer with fine maze. 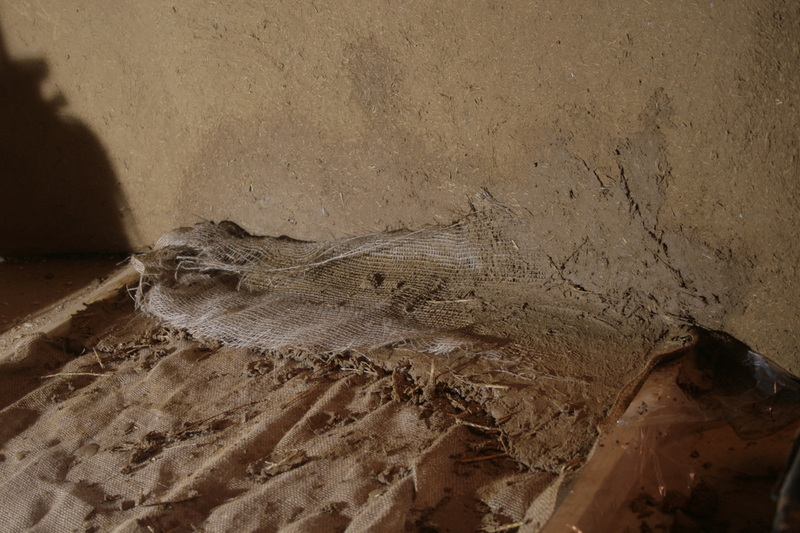 When a load would bent the boards downward (underneath the loam layer), a burlap reinforcement net might eliminate all stretch forces at the bottom loam layer. 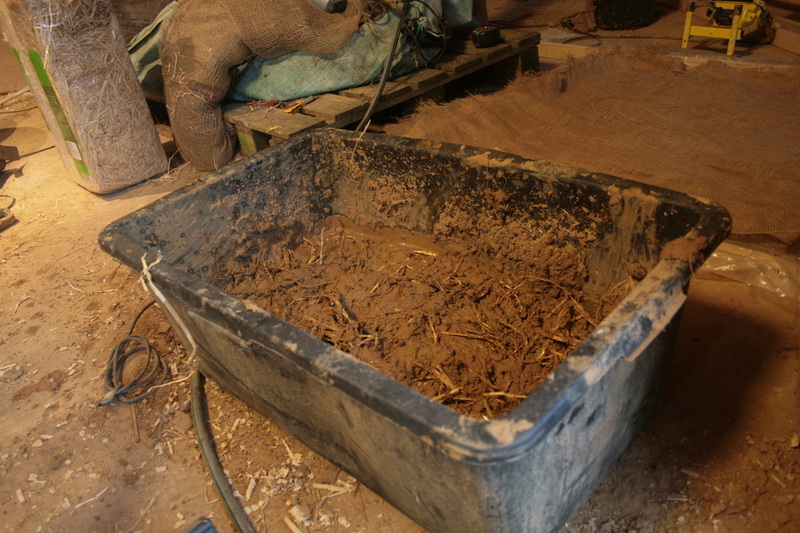 I prepared a good mixture of loam, fine sand, long straw fibers and short straw fibers. 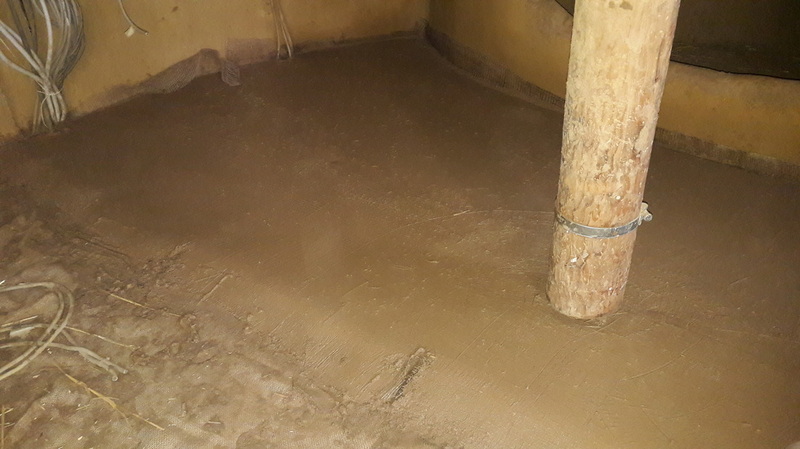 ´Pouring´ the floor was not much different from applying a loam render to a wall. Just trow balls of the loam mixture on the surface and give it a good massage. I also found that tamping it firm with a flat hand (like you would do on a horse neck to say 'good boy!') helps it compact a lot. At the joint between floor and wall I added a piece of burlap right away to prevent cracking and get a seamless transition. 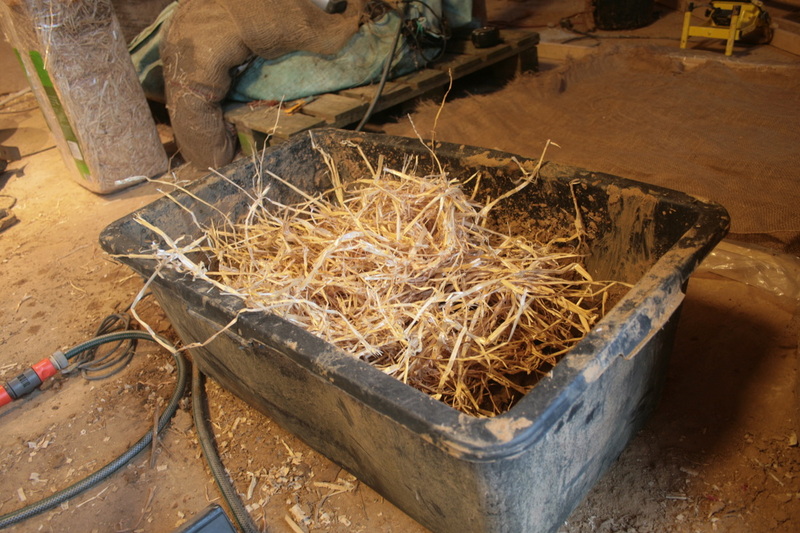 The test area was divided in two, on the left side I added an extra amount of long straw fibers to compare the resitance of both sides against cracking. 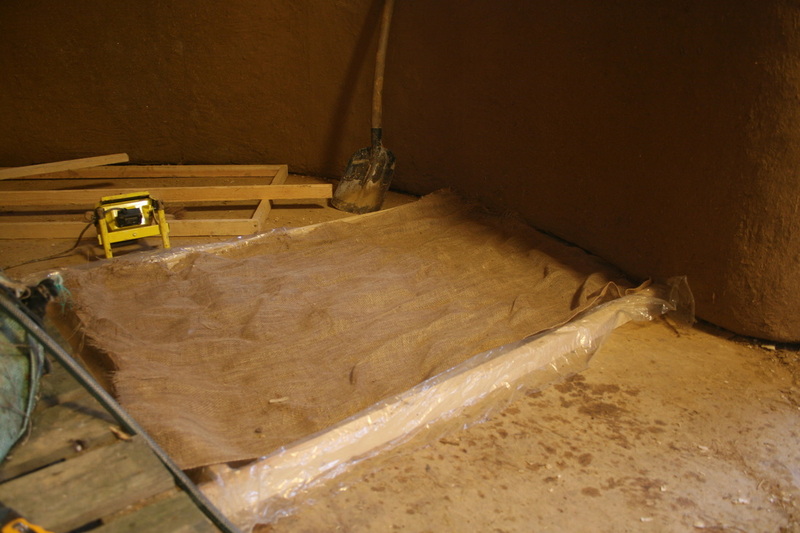 Finally I added another burlap layer and covered it with a thin, wet coat of loam. To finish the sample we added another 2,5cm layer of loam. We divided the sample area in 6 'tiles'. Every Tile had a different mix. We added Ashes, linseed oil, chalk (lime) and different amounts of sand to the mixes. They all had a good result, but almost all of them cracked at some point. The cracks were filled up again by spunging them and in most cases only one spunsh session was needed to get a result without cracking. One tile remained without cracking during the whole drying process. 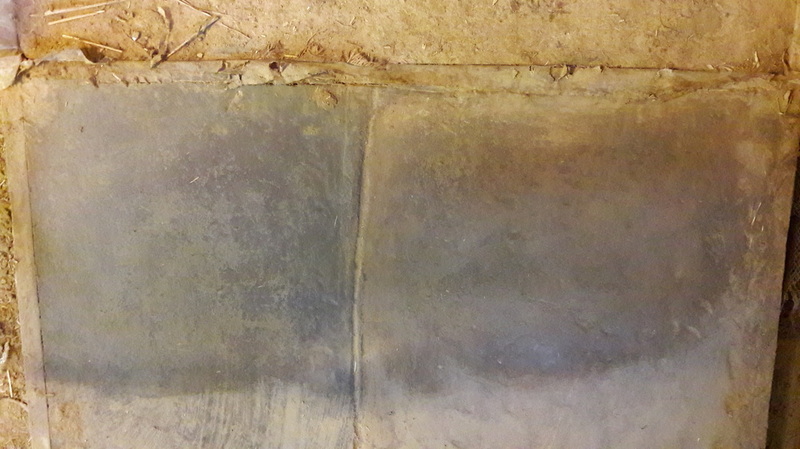 This tile was actually without any additives, it was simple loam with a slightly higher sand-content. The second best result I got with the same mixture, but with a little bit of lime mixed in the final layer. I decided to finish these two best tiles with linseed oil. Normally you need between 3 and 5 layers of linseed oil, but because this was only a try-out I kept it on 3 layers. The mix with chalk was lighter of colour, while the other turned very dark when I added the oil. It took about 1,5 months to dry the first 2,5cm layer and another month to dry the second 2,5cm layer. The linseed oil was dry after two weeks. the result was amazing! The surface was hard, waterproof and I tried jumping and stamping it as hard as I could to see if any cracks would appear: no cracks at all! When we broke down the sample area we were even more surprised to see that the whole sample area came out in one big piece!! We could carry the sample floor out with two and noticed how it was gently bending between the both of us, but it didn't crack! It was only when we threw it on the ground that it broke in two. We were convinced the whole floor would be able to take in shocks and movements!!! Start the final poured loam floor! We installed a plastic foil to prevent the loam floor to attach to the wood and also to prevent humidity seeping into the wood. 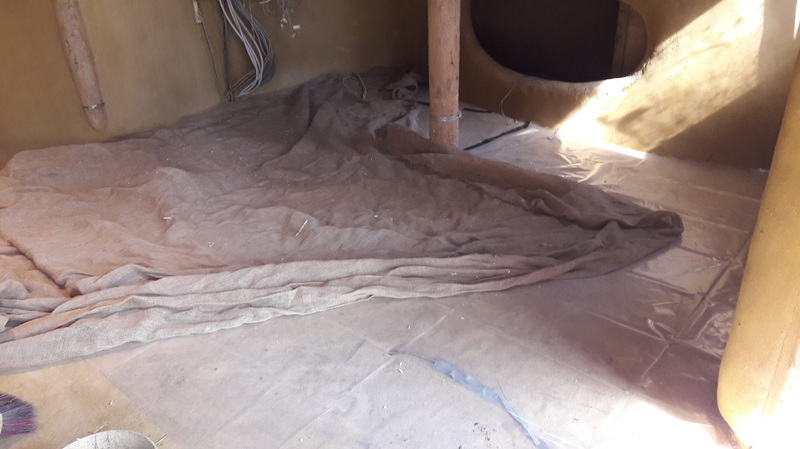 ​On top of th plastic tarp we added a layer of jute burlap. This layer will attach to the bottom of the loam floor and give it tensile strenght. This will prevent cracking from below. ​We scewed 4cm high wooden sticks into the boards every 60cm (more or less). These will keep the level line. Make sure to taper them so they are easy to remove after the loam is installed. We used a loam mix with a high content of coarse sand (0.5mm) and a combination of short and long straw fibres (the more the merrier). We filled it up to a little below the level. Than we used a mix with only short straw fibres to fill it up just a little above level, this is mainly done to prevent pulling out big chumps of straw and loam when smoothing out the surface. The filling process is mostly done by hand. ​A metal ruler (see picture above) was used to remove the excess of loam by sliding it over the sticks, pushing it firmly down. ​With the first go, you can tilt the metal ruler almost vertical to remove most of the excess material, with a second go you can hold it on a gentle sloop to get a smoother finish. You can remove the sticks by sliding them towards you, this prevents the loam from bending upward. We used a wet loam mix with a good amount of short straw fibres to fill up the holes between the segments. It's better to make the fill a little lower than the levelled out segments: the recess will be filled with the final layer. 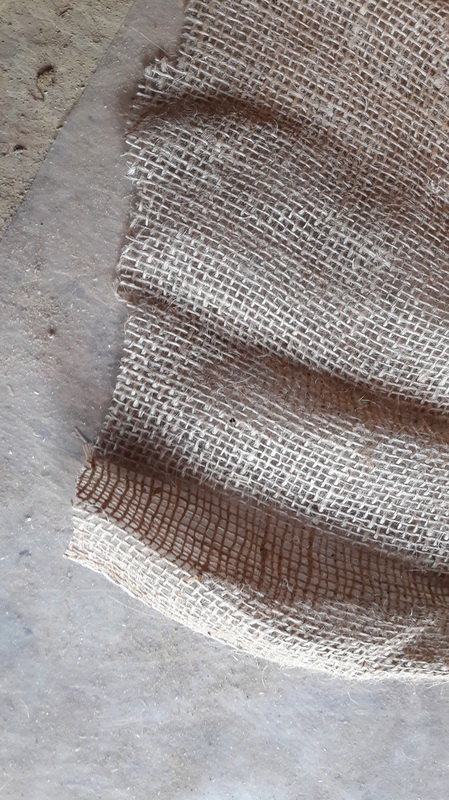 ​Next we GENTLY rubbed a jute burlab with big mazes into the loam. We covered the burlab with a thin , very wet layer of loam slib to Ensure a good connection of the burlab netting and the loam. ​A trowel to (again GENTLY) remove the excess loam slib from above the netting. Et voila: you are done! To allow a good transition , we tappered the floor down at the end. We will install a new netting above the tapered side of the previous part, and by doing so, create a good overlap with the previous netting. To prevent us from leaning into the loam floor when we are working on it, we used a left over beam and some stick to create a overhanging bridge. ​When working with two one can act as a counterweight, while the other works on the floor. When working alone you can screw the back of the beam into the OSB boards. 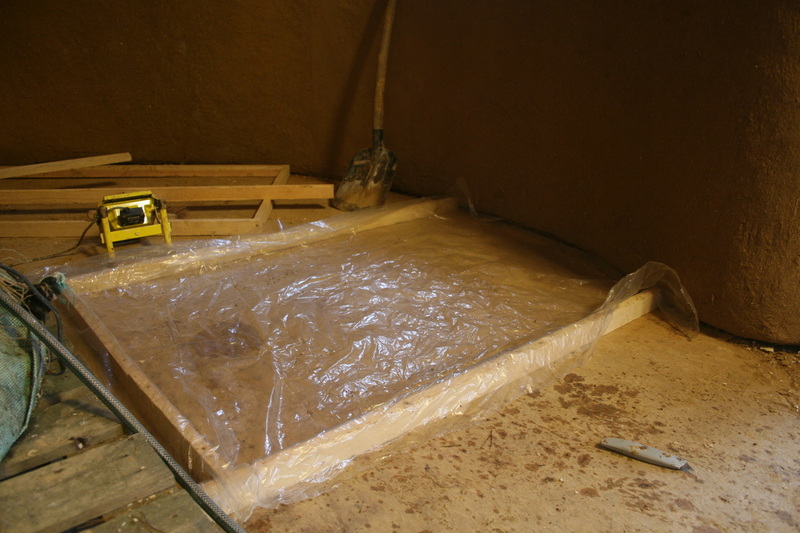 When the first thick layer (4cm) is fully dried, we again put sticks of 1cm on top of the leveled loam subfloor. 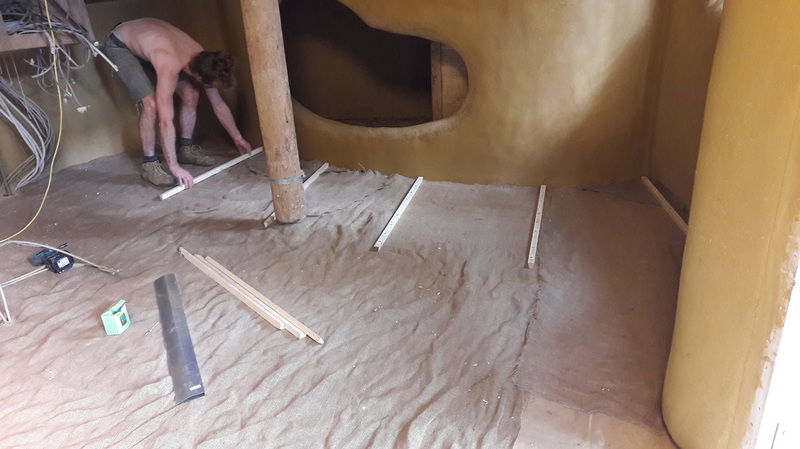 We use loam with short (hemp) straw fibres to finish the final floor level. I use sticks of 1 cm to determine the height of the toplayer. Make sure the sticks are not resting on any bump or dirt particle by moving it left and right. Add a layer of loam. This layer should be as dry as possible and rich on sand and fibres (hemp in my case) to prevent any shrinkage cracks when drying. I haven't used any additives, but I would recommend to use cow dung or wheat paste to prevent cracks. By using a metal stick of 1cm I'm able to determine the exact height of the layer. When placing the trowel on top of the previous finished part on one side and on the stick on the other side, you create a seamless and perfectly flat top layer. 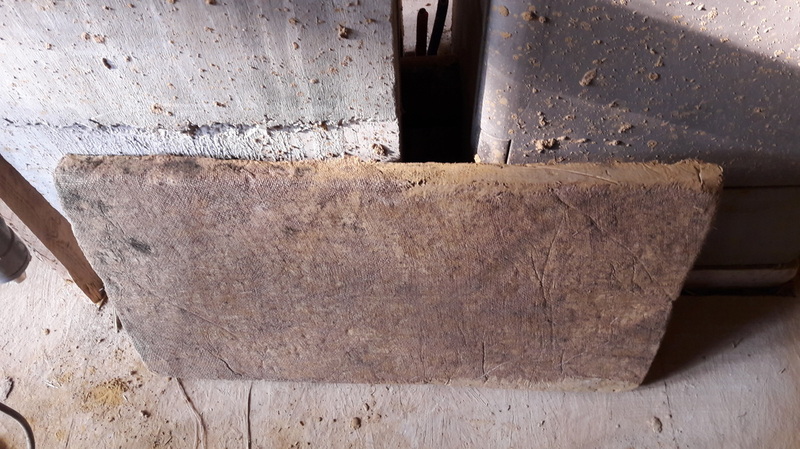 Here you can see why it is important to go in small steps, otherwise your trowel will not be able to bridge the stick and the previous finished part. To make the surface nice and smooth, I used a stiff and wide trowel. Using a flexible trowel does get a slightly smoother result, but it might cause bumps in the layer. I worked on the floor every weekend. Every newly added section would, by consequence, dry during the week (5 days). Allthough I always made the previous layer wet, I still had a few cracks when the floor was fully dried. The cracks appeared on the seams between the weekly sections. So I would definately recommend to wet the previous sections really well before starting a new one !!! 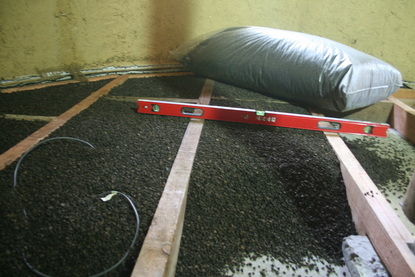 Covering it with a plastic tarp might also help slowing down the drying process. We chose to have a smooth transition between floor and wall, this allows you to have no seams, plinths or sharp corners that can accumulate dust. 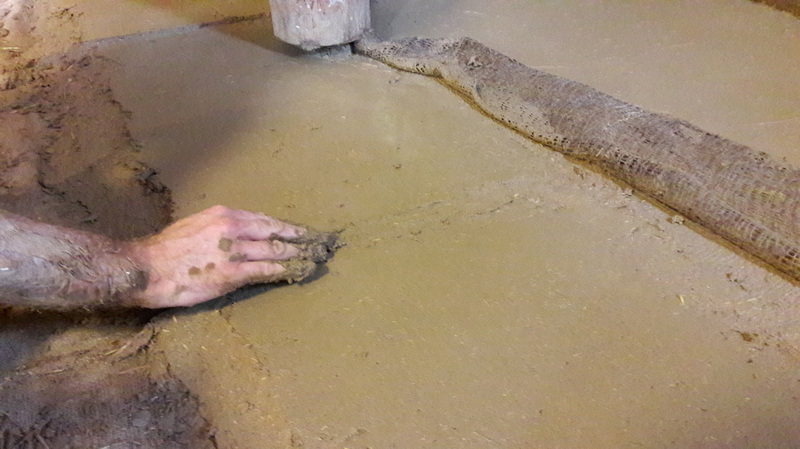 Make sure to wet the existing surface really well,work the loam in by slapping and rubbing to get a good bond with the wall and floor. I used wheatpaste as an additive to prevent cracks and get a better bond. As an engineer I'm accustomed to use 3D software and 3D printers so I designed a little tool to help me maintain the exact same corner blend all around and made a 3D print of it. It worked great! Using a glass bottle, plastic lid or tube might also do the trick. 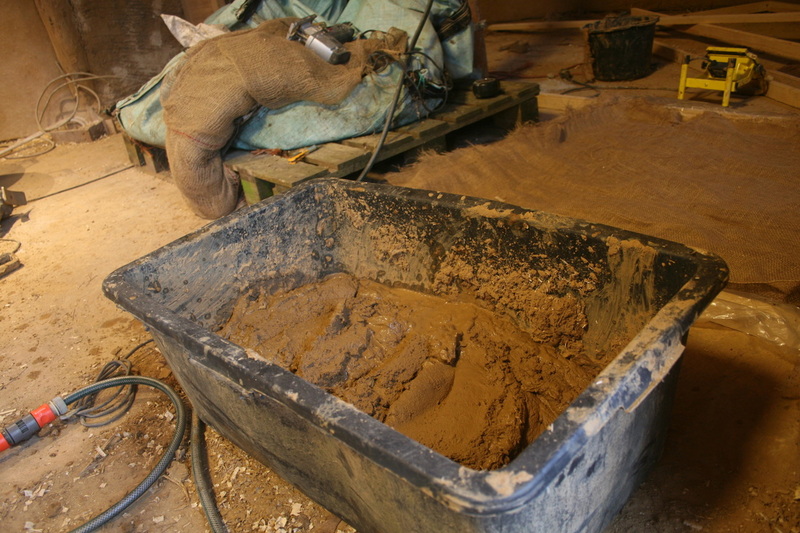 When the final layer of loam is fully dried, we removed all of the loose sand particles (spunging or vacuum cleaning) and gave it 2 layers of loam paint of the same colour. This takes out the difference in colour on some spots. You can make your own clay paint or allis by adding wheatpaste to the mix untill you have a "heavy paint"-like substance. Now you can start rubbing the floor with linseed oil. You need about 3 to 5 layers of linseed oil to fully saturate the floor and make it water repellent, hard and dustfree! It's REALLY important to prevent puddles and so after a little hour or so it is wise to go over the floor with a rag and remove the excess of oil otherwise it dries up on top of the floor and stays sticky.